Whilst walking the Halle floors downstairs at the M.O.C. on the very first I day I bumped into Team LH Labs. Casey Hartwell, Gavin Fish and his very patient daughter (a self-proclaimed ‘geek’) were touting the second generation Geek Out dongle DAC / headphone amplifier. Over the course of the past two years, LH Labs has gained both fame and infamy in bringing audio products to market using only crowdfunding methods. When Geek Out v2 was announced a few weeks prior to Munich, my ears pricked up. Not because of the hardware itself mind. It was the absence of an Indiegogo funding campaign that caught my attention. Had Fish, Ho and co. lost their nerve? Casey Hartwell (far right) and Gavin Fish (to his left) at Munich High-End 2015. Alas, LH Labs just can’t help themselves. What started as a $1 reserve price for pre-orders has been moved to Indiegogo for payment completion. “The way it’s working is that we offered the V2 for pre-sale on the LH Labs Marketplace accepting a $1 deposit for the V2 to secure your unit and a spot in the shipping queue,” says LH Labs marketing man Casey Hartwell. I suspect the reach of Indiegogo’s marketing tools is behind this move. “Shipping queue?”, you exclaim! LH Labs will soon be announcing shipping dates in advance of each product batch heading out the door. That news will be cold comfort for backers of the Geek Pulse who waited over a year between payment and delivery but it does show that these Californians are at least trying to improve on managing the expectations of campaign funders. Version 1 of this dongle DAC left me cold because it ran so hot. Ironic, hey. At CES in January, Gavin Fish informed that heat – a byproduct of Geek Out’s Class A amplifier circuit – was a deliberate part of its design. The palm-sized metal chassis soaked up the calefaction up and then slowly released it. That begat too much (irrational) fear of baked tabletop for this fella. The market might be well accustomed to Class A monoblocks metaphorically glowing orange in fully-fledge two channel rigs but on the desktop it feels like a no go. Perhaps some mental re-alignment is required in the portable head-fi space but for this reviewer but Geek Out’s first out was a definite miss. After a quick scan of v2’s Indiegogo page, it comes as no surprise that the DAR logo is M.I.A. from the list of publications lending their approval to v1. But Gavin Fish and Larry Ho do seem to be listening: beating the heat was reportedly a focus for Geek Out v2. Hartwell pushed a prototype into my hand in Munich – I have proof of life – and I’ve since been giving it the touch test here in New York, en route to T.H.E Newport Beach in Irvine this coming weekend. It’s true; Geek Out v2 doesn’t run as hot as its predecessor. So what gives? The most obvious change is to the chassis. Bye bye metal casework. Hello 3D-printed, heat-resistant 3-piece epoxy/resin. The slide in base sports a serious number of ventilation slits that complement the internals’ heat sinks. Fish tells me that LH Labs’ Sacramento production facility can currently print 50 chassis per day. On the inside, Larry Ho’s completely revamped circuit: fully balanced, fully Class A with an ESS 9018-AQ2M chip handling D/A conversion and volume control. 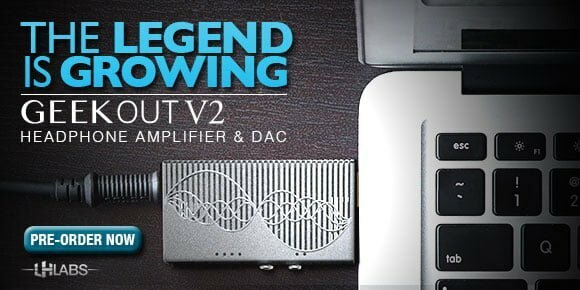 Similar to the AudioQuest Dragonfly, the DAC receives digital markers from the host PC that correspond to analogue, on-chip equivalents. 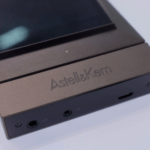 The side buttons will ultimately control digital filter selection and gain settings: 100mW and 1000mW on the standard version whilst a Signature Edition will feature an additional 450mW setting. You’ll see from the photo that an XMOS chip plays the role of USB data butler. PCM feeds up to 32 bit/384kHz, DSD64 and DSD128 are all covered. Finally, one of the prototype’s 3.5mm TRS sockets will be switched up to a 3.5mm TRRS for those who like to power their headphones in balanced mode. Geek Out v2 will begin shipping July 1st…probably. Previous article Munich High-End 2015: Is MQA the new DSD? Fulfilling their promoses to backers who wait > 1 year or more for products. Pulse, 16 months. Geek Wave? Bueller? Developing a consistant QC protocol. When and if we get product, it will be RMA’d. Don’t let the marketing machine trick you into a ‘5%’ failure rate. It’s the 21st centure version of The Emporer’s New Clothes. I have a v1 GO resting on a heavy duty metal coaster that my wife had in the room, now I have peace of mind LOL fit perfect no worries about the heat. I am still waiting for my Pulse and Wave. Some Pulse Infinity backers are still waiting for their units to arrive (myself included) and have no idea when we’ll receive them due to yet another delay fabricating the revised Pulse chassis. LH Labs are masters at consumer manipulation and extracting monies from backers with innumerable product upgrade `perks’ and promises of superlative performance, yet have delivered little tangible proof of their sonic superiority – at least to Pulse Infinity backers anyway. I have been a backer of their Geek-Out v.1, Pulse with LPS and Source. Just last week I received my Pulse which I financed in 2013. The Source is not even fully designed yet. In the meantime, they barrage us with constant flow of new perks. It seems like their product design cycle never ends. I have one advice for Mr. Fish. Design only ONE product at a time, with modular options that can be purchased and added at any time and deliver it within 6 months instead of years. Maybe then I will come back for more. Until then, no more backing from me. The Pulse I ordered in 2013 looked very promising – on paper. But today, I have no use for the Pulse, because I moved on from computer-based source to a dedicated player/streamer. So, if anybody in the continental US would like my unused LHLabs Pulse (with LPS), I am willing to sell it for less than the current price. I have received my Pulse fi and can assure you that the wait is worthwhile. You will enjoy it, I assure you, both as a headamp and DAC in a larger system. 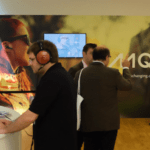 Munich High-End 2015: Is MQA the new DSD?